Two volumes contained within a cardboard slipcover, including video programme notes by Jim Shedden and Dawn Caswell. This publication contains two separately bound books within a slipcase. The first volume, Raincoats, Suitcases, Palms, contains essays by Toronto writer Dot Tuer and German writer Matthias Winzen, an interview with the artist by Dot Tuer, and a complete biography, videography, and bibliography. 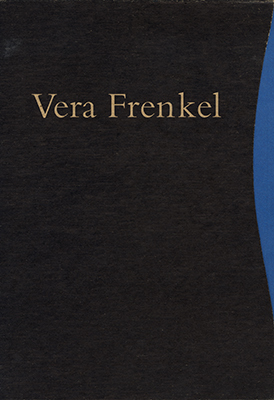 The second volume, The Bar Report, has been conceived and designed by Vera Frenkel. In this volume, she uses a collage-freize throughout, and an original silk-screen print, Recovering Memory, cut into nine different page-size segments, one sheet of which is tipped into each book. Text is in French and English. Winner of both the Ontario Association of Art Galleries 1994 Design Award and Curatorial Writing Award.